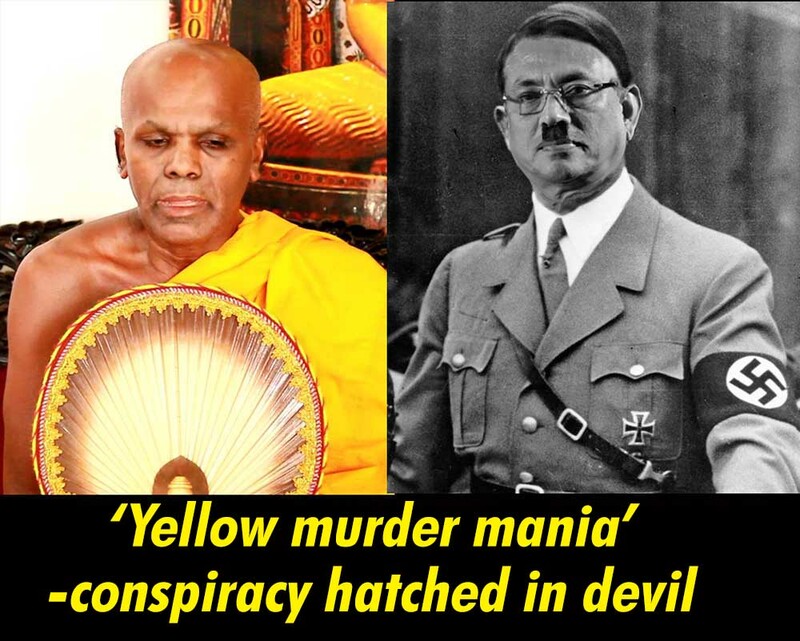 (Lanka e News -24.June.2018, 11.25PM) A ‘yellow murder mania’ which is a challenge to laws , justice and pristine Buddhism is most dangerously rearing its monstrous head across the entire country. This group of blood lusty yellow monsters under the pretext of helping the hooligan monk Gnanassara who was in jail wearing the ’jumper’ met at the residence of Gotabaya the devil incarnate most stealthily and conspiratorially. This most dangerous mad contagion is being spread by Asgiriya chapter Anunayake (deputy prelate ) , a robed monk by the name of Upali. This mad maniacal monk despite wearing the sacred saffron robe and professing to follow Lord Buddha the prince of peace and non violence had shockingly preached to Gotabaya to become another Hitler the demented dictator who directly killed 11 million people within the torture chamber and murdered 26.5 million people directly during the war in Europe alone. This was the advice given by this mad monk to blood lusty Gotabaya the murderer on his 69 th birthday after gourmandizing at the dhana given to monks. . It is a pity this monk while preaching Buddhism hasn’t the mental capacity to understand this is the Hitler he is extolling and exalting as a model to follow (and above Lord Buddha) who earned the wrath and displeasure of the entire modern civilized society . Unbelievably this was the satanic sermon delivered at the birthday celebration of the devil incarnate Gotabaya the most notorious criminal by another devil’s disciple in saffron robe. Both being blood lusty vampires , both enjoyed the birthday party on this birthday message which ruthlessly encouraged a blood bath in the country. The demented monk further advised the devil incarnate Gota to become another Hitler and run a military administration. It is the consensus of all, such requests can be made only by an insane individual and not one who is sane and in his senses. Hence , before this country is plunged into a blood bath by the ‘yellow murder mania’, it is for the sane and sensible rulers, true sons of Buddhism and civilized citizens to take urgent and crucial decisions to avert the imminent blood bath and holocaust .